Tag Archives for " Moleskine "
About fifteen years ago I bought and fell in love with a little pocket sized notebook I found at Barnes and Noble. The company offering the notebook was a little startup in Milan called Moleskine, but the notebook had a long and storied past. The Moleskine notebook is, in fact, the heir and successor to the legendary notebook used by artists and thinkers over the past two centuries: among them Vincent van Gogh, Pablo Picasso, and Ernest Hemingway. The original, A simple black rectangle with rounded corners, an elastic page-holder, and an internal expandable pocket, was produced for over a century by a small French bookbinder that supplied the stationery shops of Paris. In in 1986, the small family-owned company in the French city of Tours, went out of business. In 1997 a small Milanese publisher brought the legendary notebook back to life. I’ve filled hundreds of these notebooks over the last 10 years or so as a way to capture thoughts, ideas and to do lists. For me they represent the tactile connection to the written word that has been increasingly replaced by this keyboard. 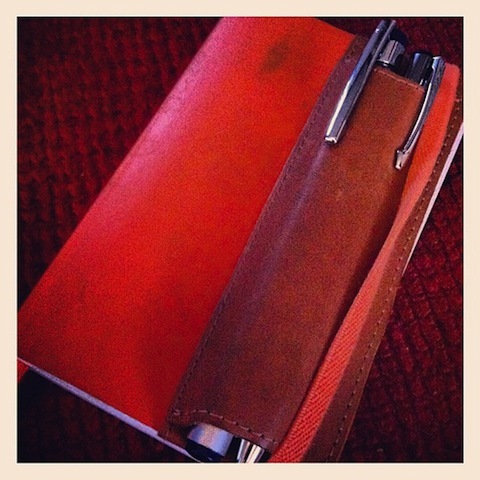 In fact, writing in these notebooks is about the only time I touch pen to paper anymore. One of my favorite pastimes is to dig a few of these filled notebooks out and thumb through them reliving moments and scraps and forgotten flourishes of ideas. I found this handy little pen Quiver a while back and it’s the perfect add-on. You can get these notebooks in many forms, functions, sizes and colors (check out the architecture and design series) and a handful of knockoffs have sprung up as well, but I’ll probably stick with the original Classic Pocket Plain, in a fashion forward orange of course.